Booting into GRUB is typically a straight forward process in Linux, as GRUB is included with the install of the operating system. You power on the system, and the GRUB boot loader appears. If the GRUB boot loader does not appear during boot, the grub timeout is 0 or is hidden (explained below). There are a number of different GRUB files on the system. /boot/grub2/grub.cfg This is the file that is used during boot. Do not edit this file. /etc/grub2.cfg This is a symbolic link to /boot/grub2/grub.cfg. Do not edit this file. /etc/default/grub This is the file that contains the GRUB variables. You can edit this file. /etc/sysconfig/grub This is a symbolic link to /etc/default/grub. Do not edit this file. /etc/grub.d This is a directory that contains additional files used by GRUB. Do not edit these files. Different Linux distributions may have a slightly different location and name of the GRUB files. The find command can be used if your GRUB files are no located at the locations describes in the table above. Following is one possible configuration of the /etc/default/grub file. In this example, GRUB_TIMEOUT=5 will display the GRUB screen for 5 seconds. Also, there is no hiddenmenu option, to ensure the GRUB screen is not hidden. GRUB_DISTRIBUTOR="$(sed 's, release . *$,,g' /etc/system-release)"
When making changes to the GRUB configuration file, the grub-mkconfig command is required to write the changes. There are 4 options at the GRUB screen. Select a kernel to boot into. The GRUB screen lets you select a kernel image to boot from. You can simply highlight the kernel image you want to boot from and then press enter to boot the Operating System. Or, you can wait for the GRUB timeout to occur, which is 5 seconds in the example above, and GRUB will automatically boot into the highlighted kernel. If there is more than one kernel displayed, and you want a certain kernel to be the default selected kernel, in the Linux OS, display the kernels. To use the first displayed menu entry, use 0. To use the second displayed menu entry, use 1. At the Grub menu, press e to view and edit the boot parameters. Probably the most relevant information are the last two lines, the kernel and parameters that will be used. As an example, the word quiet can be deleted to display boot events during boot. Press c to enter the GRUB command line prompt. Use the ls (list) command to display the available boot devices. In this example, HD0 has three partitions, HD1 has two partitions, and FD0 has one partition. The ls command followed by a partition followed by a forward slash will display relevent files in the partition. In this example, HD1 contains the files needed to boot the operating system. At the next prompts, you will enter the kernel and parameters to use. You may want to use similar kernel and parameters from the GRUB edit screen. If all goes well, the machine will successfully boot. 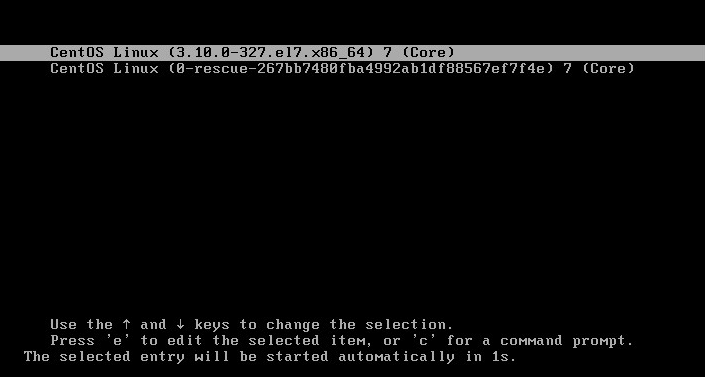 Pressing esc will display the boot command. This is typically used when you want to perform a kickstart installation of Linux. In this example, a kickstart installation is started using the ks.cfg file on an NFS share.